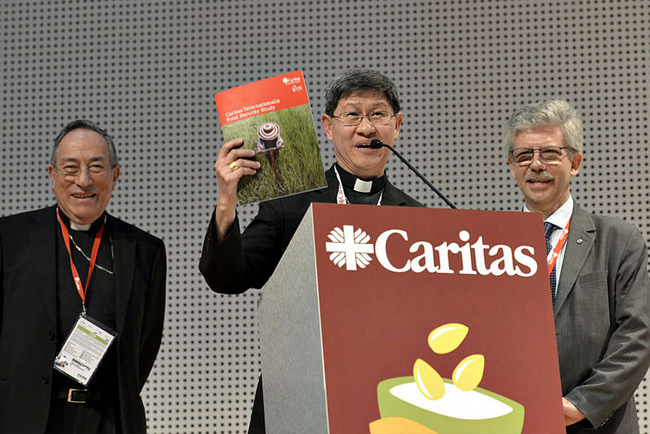 The survey was presented by Cardinal Oscar Rodriguez Maradiaga, outgoing president of Caritas Internationalis, to Cardinal Luis Antonio Tagle, incoming president, at the EXPO 2015 in Milan. According to 98 Caritas organisations, the national Catholic charities in countries comprising 83 percent of the world’s population, the top three causes of food insecurity are lack of resources – land, seeds, loans, access to markets – for small farmers, low agricultural productivity, and the impact of climate change. Dr. Carolyn Woo, President of Catholic Relief Services (CRS) said, “this survey echoes what we are told daily. We know how hard small farmers struggle to put food on the table year round and how climate change is making farming even more difficult for them, they tell us.” CRS partnered in the survey’s creation. Caritas estimated that an average of 106 million people had benefitted from its food and agriculture programmes in 2013. The top areas of focus were farmer training (41%), sustainable agriculture (39%), food or seed distribution after emergencies (39%), and improving nutrition and health (39%). There were significant variations among regions in the reasons for hunger and food insecurity. Caritas offices in Sub-Saharan Africa emphasized low agricultural productivity and climate change more than people did in most other regions. In Asia, the emphasis was on lack of smallholder farmer access to resources, plus the lack of governance. Respondents in Latin America and the Caribbean shone the spotlight on food price speculation and lack of infrastructure. Middle East and North Africa struggled more than most with conflict and lack of clean water. Expert available for interview: Martina Liebsch, Caritas Internationalis. Contact Laura Sheahen at sheahen@caritas.va or +39.335.823.4233 for interviews.